Heat 2 tbsp of the oil in a large nonstick frying pan over a high heat. Add the nduja and cook for 4 minutes or until crispy. Place in a small bowl and set aside. Wipe the pan clean with paper towel. Add the remaining oil and place over a high heat. Add the cabbage, garlic, thyme, salt and pepper and cook for 2 minutes or until wilted. While the cabbage mixture is cooking, cook the pasta in a large saucepan of salted boiling water for 3 minutes or until al dente (if using dried, have your cooked pasta ready). Drain, reserving 125ml of the cooking water. Add the pasta, reserved cooking water and nduja, reserving the nduja oil, to the cabbage mixture and toss to coat. 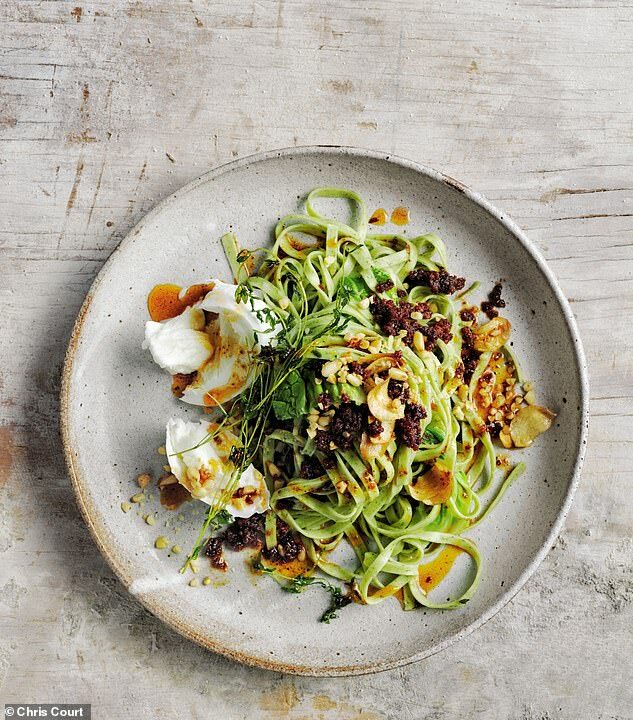 Divide among bowls, top with the mozzarella and pine nuts and drizzle with the reserved nduja oil to serve.